Well this weekend is a huge Aviation event at Chino, this is a MUST see show and you will not believe te sound, the smell and the camaraderie at this show. If you want to do something exciting, check the show out as there are tons of things to do and see and the kids will get a kick out of the planes as they fly past low and loud a truly amazing sight to see WW2 planes and modern intermix. Go check it out on Saturday or Sunday, you will be amazed I guarantee it. Mooney International Corporation is proud to present Planes of Fame Air Show 2014, May 3 & 4: “A Salute to the Mighty Eighth“. This year’s airshow will feature over 40 historic aircraft, performing for your enjoyment as well as a salute to the 8th Air Force in WWII. We invite you to Airshow 2014 to celebrate the history and contributions of the men, women, and aircraft of the 8th Air Force. Performers include U.S.A.F. F-22 Raptor Demo Team and Heritage Flight, Sean D. Tucker-Team Oracle Aerobatics, The Bremont Horsemen, Sea Fury Aerobatics by Sanders Aeronautics, Clay Lacy’s Learjet Demonstration, Rob Harrison and the Tumbling Bear, John Collver’s AT-6 Aerobatics, and over 40 WWII aircraft including B-17, P-47s, and P-51s. In addition to many other fantastic airplanes performing, there will be a panel discussion with our honored veterans of the 8th Air Force, which include Clarence “Bud” Anderson, Jack Croul, Jim White, Wilbur Richardson, and George Thomas. Also, be sure to catch the Airshow Preview Event on May 2! Check out the Air Show Promotional Video here. If you are interested in helping to sponsor Air Show 2014, click here to learn about the opportunities! A terrific selection of merchandise will be on sale in the Vendor Marketplace as well as delicious food and beverages. Reserved bleacher seating will be available; look for information under Ticket Information on the FAQ page when available. SEE THE AIRSHOW 2014 SHOW SCHEDULE HERE. 4:00 End of Air Show Thank you for coming! AIR COMBAT COMMAND F-22 DEMONSTRATION TEAM – The Air Combat Command F-22 Demonstration Team at Langley Air Force Base performs precision aerial maneuvers to demonstrate the unique capabilities of the world’s only operational fifth-generation fighter aircraft. THE BREMONT HORSEMEN – The world’s only P-51 Mustang formation aerobatic team. Since that time, the team has grown into flying other platforms in formation. Even though they change up our aircraft, their philosophy of flight has never changed, ESCAPE LIFE’S GRAVITY! CLAY LACY LEARJET DEMO – The National Aviation Hall of Famer performs amazing aerobatics in his Special Ops Lear 24 “Smoker” jet! SEAN TUCKER AEROBATICS – Sean is the world’s premier performer in terms of entertainment value, piloting skill and professionalism, flying airshows world-wide since the mid-70’s and winning numerous aerobatic competitions. In that time, Sean has flown more than 1000 performances at more than 425 airshows, in front of more than 80 million fans. ROB HARRISON “THE TUMBLING BEAR” — Rob has been a local Southern California favorite airshow performer for more than 20 years. He started flying with his Dad at the age of six and by age 13, he was doing aerobatics. He retired after 28 years as US Forest Service program leader for aviation and helped engineer and develop the fire air tankers still in use today. Now at 72, he is still inspiring the young to learn to fly. Rob says “If you put your mind to it, study and work hard, you can do anything you want to! SEA FURY AEROBATIC DEMONSTRATION – Dennis’ aerobatic routine in the Sea Fury, Argonaut, with smoke generators on the wingtips! THE KOREAN AIR WAR REENACTED – F-86 Sabre and MiG 15 in a dogfight! An annual spectacular performance by the Planes of Fame’s own Sabre & MiG and stellar pilots! JOHN COLLVER AT-6/SNJ AEROBATICS – Thrill to the T-6 aerobatics by John Collver as he takes his War Dog through exciting maneuvers! Truly a salute to freedom! A BIG THUMB’S UP! 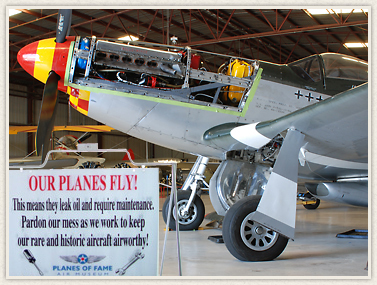 – For all the Planes of Fame pilots & planes, the visiting show participants and their aircraft (both flying & static!) and VIP veterans, all of whom put on the most memorable airshow each year. Nearly 40 aircraft fly from every era! This entry was posted in Blog and tagged 8th air force, b17, b29, hurricane, p40, p47, p51, spitfire, ww2 planes.